Ideally situated 17kms from the Bergville/Ladysmith N3 off ramp and +- 60kms from the Northern & Central Drakensberg Valleys and all they have to offer. Easby caters for everyone. From that weary traveler looking to break the long slog between cities. To the tourist looking for a central location to base their explorations from. We are also fast becoming a favourite destination of many a biker breakfast run! One room sleeps 3 (1x double bed and 1x single bed). 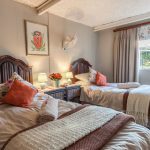 A self catering cottage which sleeps 4 (1x Room with double bed and one Room with 2x single beds). Dinners available on request. Enjoy a home-cooked meal and pudding with us. There is a microwave available on the verandah or in the dining room. Bar Fridge, stocked (price list available), Welcome to bring your own drinks if you prefer. Wall Heater and electric blankets for those chilly nights. The house itself has a history extending over 100 years. 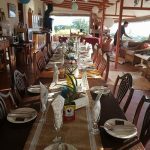 The atmosphere generated by this beautiful dwelling and its’ owners Carlos & Tish Pereira, is coupled with stunning views to help generate an experience you wont soon forget. 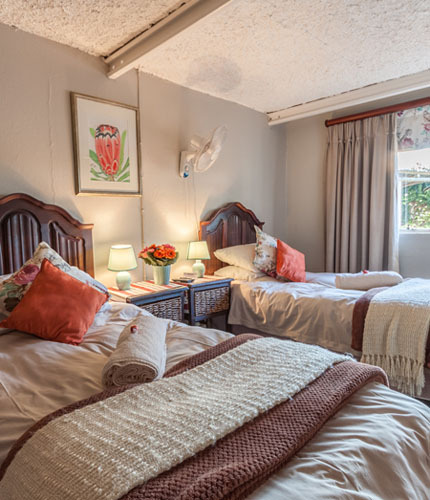 With sweeping views of the surrounding veld, farms and the most beautiful views of the berg on show. You will be charmed by all Easby has to offer. The communal veranda where meals are served, turns out also to be the best place from which to enjoy the sunset and unwind, feeling the stress drain away as the last of the sun’s rays decorates the sky. Only to be covered with a perfect star lit night.